A former Group Managing Director of the Nigerian National Petroleum Corporation, Andrew Yakubu, has asked the court to return the $9.8million and £74,000‎ recovered from him by the Economic and Financial Crimes Commission, EFCC. Yakubu has, therefore, instituted a suit at the Federal High Court, Kano requesting it to set aside the order of forfeiture granted to the Federal Government last week by the court. He said the court had no jurisdiction to grant the order. 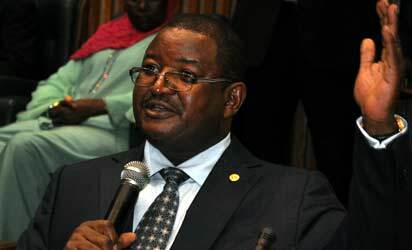 The suit was filed by Yakubu’s counsel, Ahmed Raji (SAN). Raji argued that the court lacks the territorial jurisdiction to entertain the matter. He said the crime was committed in Abuja, which is outside the territorial jurisdiction of the court in Kano. In the motion on notice with suit number FHC/ICN/CS/24/2017, Raji argued that by Section 45 of the Federal High Court Act, an offence shall be tried only by a court exercising jurisdiction in the area or place where the offence was committed. He said: “No aspect of the perceived offence in respect of which the Order of 13th February, 2017 was made, was committed within the Kano judicial division of this Honourable Court. “By Section 28 of the EFCC Act, only the commission, i.e. the EFCC has the vires to seek an Order for the interim forfeiture of property under the Act. “The power of this Honourable Court to make interim forfeiture Order(s) pursuant to Sections 28 & 29 of the Economic and Financial Crimes Commission Act, 2004 (hereinafter “EFCC Act”) is applicable ONLY to alleged offences charged under the EFCC Act and not to offences cognizable under any other law. “The ex-parte Order of this Honourable Court dated 13th February, 2017, was made in respect of alleged offences under the Independent Corrupt Practices and other Related Offences Commission Act (hereinafter “ICPC Act”) and not the EFCC Act as prescribed by Section 28 and 29 thereof. “The conditions precedent to the grant of an interim forfeiture Order under Sections 28 & 29 of the EFCC Act were not complied with by the Applicant before the Order was made.